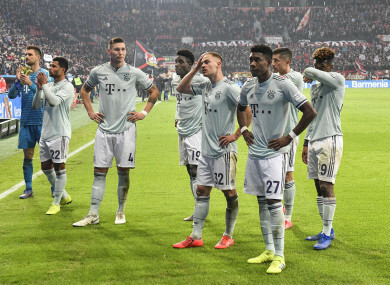 Disappointed Bayern players stand in front of their supporters after a shock defeat to Bayer Leverkusen. BORUSSIA DORTMUND DROPPED points but extended their lead at the top of the Bundesliga on a topsy-turvy day of football in Germany. While Dortmund drew 1-1 with Eintracht Frankfurt, they stretched their lead to seven points as Bayern Munich lost 3-1 away to Bayer Leverkusen, now coached by failed Dortmund manager Peter Bosz. Bayern led at half-time through a Leon Goretezka, but contrived to chuck it all away in the second half as the home side scored through Leon Bailey, Kevin Volland, and Lucas Alario. Marco Reus​ and Luka Jovic – two players battling it out to be the division’s top scorer – exchanged first-half goals and while neither side could find a second goal, it was ultimately a successful day for Dortmund. Bayern, meanwhile, have lost a fourth league game of the season as the pressure is heaped upon Niko Kovac. Email “Bayern shocked by Leverkusen as Dortmund extend lead at the top of the Bundesliga”. Feedback on “Bayern shocked by Leverkusen as Dortmund extend lead at the top of the Bundesliga”.